I had such a great weekend spending time with family, playing games and of course giving and receiving presents! 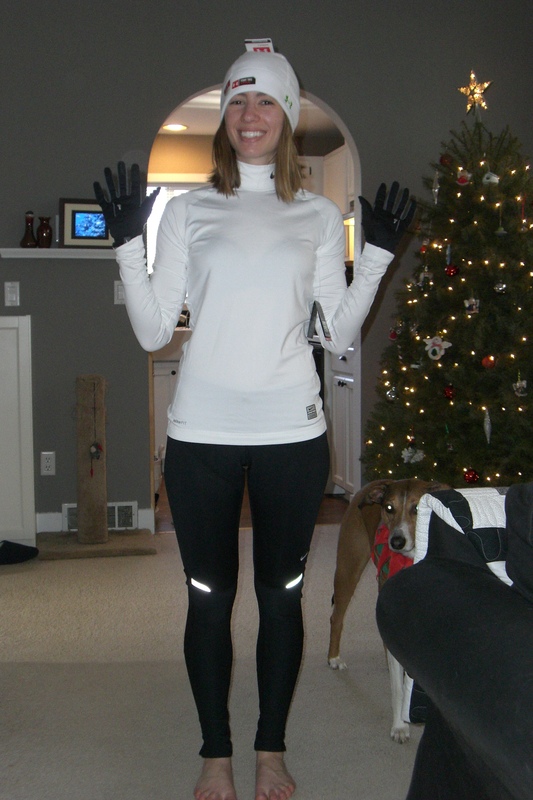 My hubby and aunts/uncles both outfitted me to continue running in the burrr cold weather. I look pretty fast right? 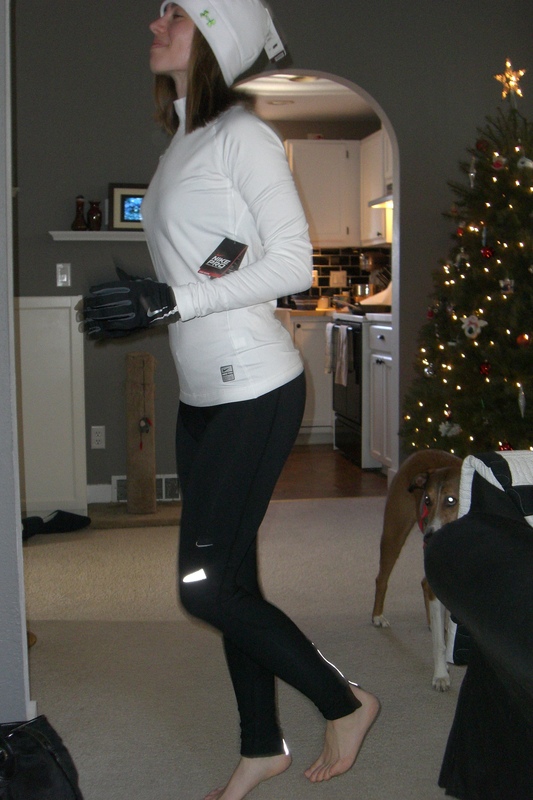 On Saturday mom and I went for a nice 30 minute run so I got to try out my new gear. It was so nice and comfy and warm to run in, I loved it! Friday before Jacob woke up Christmas morning I did 50 minutes of yoga, and then on Sunday all 4 of us were able to do 100 PUSH UPS! This is the after picture. 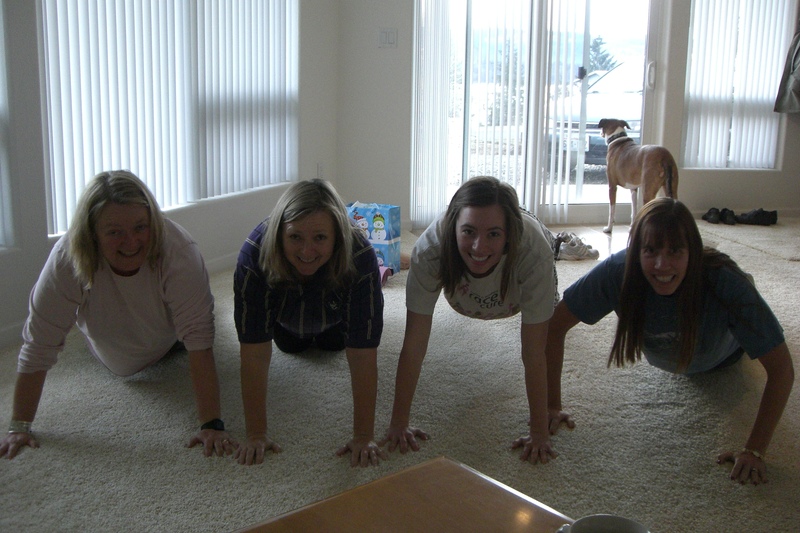 It was tough but we all managed to do the 100 push ups. I am so proud of my mom and aunts. I knew they’d be able to finish and I’m so glad they stuck with the program. I am very impressed! I was glad to get all of the exercise in that I’d planned. We ate very well all weekend. My stomach will be happy to get back into my normal eating routine again. Let’s just say I ate more than I like to. Speaking of eating, here’s a Roasted Red Pepper Hummus recipe. Try it out and let me know what you think. I’m a huge hummus fan and this one’s got a bit of spice in my opinion. Probably from the roasted red peppers. A new week of moves begin today! The lower body move of the day is the Laying Leg Lift. This really works your glutes. Hope you like it. 100 push ups all of you? gratz! congrats on finishing the program, that's awesome! I love your new hat! Fantastic! Love your running outfit too. You look great. Sorry that I wasn't one your the aunts there with you doing the pushups or celebrating Christmas with you. LOVE the new gear. You look rocking…super fast for sure 😉 Thats so fun that you all did the pushup challenge together. mmm homemade hummus <3.